Passing sidings allow trains to get around one another. Like the real railroads, simply adding tracks won't necessarily improve the operation of our model trains. Putting the right sized tracks in the right places is the key to better operation. When we start adding more trains to our railroads, like the prototype we need to add passing sidings, double track our mainlines, and/or divide the railroad into blocks. Whether you use these blocks to control the trains with conventional wiring or use them like the prototype for signaling with DCC, the length of the blocks becomes a key part of planning your layout. 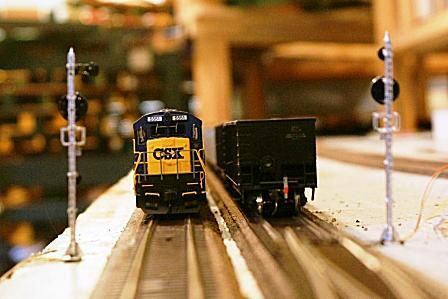 Model railroaders often get hung up on how long to make a siding or block of track. Other times, we don't think about it enough and things don't work as planned. The length of your train will have to be balanced in proportion to the length of your yards, staging tracks, etc. You don't want to run too many trains longer than your average siding, and you have to balance the length of the sidings with both the size of your trains and your layout. The best way to determine the best siding or block length is to test with a few "typical" trains. Since car lengths vary greatly with the era, and since everybody's layouts and preferences are unique, there is no simple equation to put in place here. There are a few prototypical practices that you may want to consider. Stopping distance and train separation. It is conceivable that a train may not be able to come to a full and safe stop at a distance less than or equal to its own length. Most mainline blocks will have the speed and stopping distance figured into the length of the block. This may well be longer than the trains that enter it. This is less of a factor on our model trains where the laws of physics are scaled down. Train storage. For sidings and blocks where trains may be parked, such as when waiting to get into a yard or passing sidings on the mainline, then train length becomes more critical than speed. Trains will have slowed before arriving at the siding expecting to stop. Now having adequate room for most trains that will wait there becomes a bigger priority. Short blocks. Interlockings and other parts of the railroad where trains are not expected to be stopped or held maybe only as long as needed to detect and protect train movements within that space. There is no rule that every train must fit in every siding. There is no such thing on the prototype. While we try to predict what our typical longest train will be, it is quite possible that there are one or two places where the siding just has to be a few cars short of that number. There may also be occasions when a train leaves a yard with just a few extra cars. In cases like this, you'll just have to get a little more creative with your operations. If two long trains must meet in a short siding, you may have to perform what railroaders call a "saw-by." Here the two trains are split and the crews must work together to get around one another. A more practical option is to simply try to arrange such meets at longer sidings. This is where prototypical operations become much more interesting. A train may have to wait in a yard a while longer, or at a more distant siding than planned in order to clear an oncoming train. Whether your typical train is ten cars or one hundred, a little advanced planning goes a long way towards making the railroad run more smoothly. It's still the times when all doesn't go according to plan that makes the railroad more fun!